Sonny Boy was leaving to go back to college after a short visit home. I tried to disguise the Mom questions I normally ask so as to reduce any chance of being seen as pathetic. “Would it help if I did a load of your laundry?” “Would you like me to make you a batch of cookies to take with you?” “Anything I can do to help you get packed up?” I watched as he efficiently loaded up his small suitcase. “No, I’ve got it, Mom,” he said in his mild, even tone. At that moment, when he was about to leave, I needed him to need me as a mom. I suddenly remembered all those times he had come to me as a little boy as I hurried to get dinner ready. “Can I help, Mommy?” he’d say. I was in a hurry. I had no time to involve him and yet, I wanted him to feel good about helping. “Yes!” I’d say. “You can sit right here and put all the spoons together and all the forks together. Ah yes. Two similar tasks. Two similar tables. Now turned. This transition from Active Mommy to Observer Mom is not an easy one to make. My younger son has been expediting my training in this area. He is a senior in high school. Clingy, he is not. He makes it clear that he can handle most things that come his way. He is a good egg and we are the Teflon that he is ready to spring from when the time is right. He’ll begin his college applications soon. I imagine this whole parenting adventure as a shopping expedition. Around ten years ago, my cart was full. It held heavy items associated with kids and school. In one corner of the basket was my full-time job. In the other corner was marriage and extended family, but in the middle was the messy, colorful, wonderfully surprising and complicated pile of parenting paraphernalia. Doctors' appointments, birthday parties, soccer practices, big spur-of-the-minute dinners with families, games, school activities, all there at the center of my life. Yes, it was heavy and more than unwieldy at times. Yes, there were times when I got tired of pushing it and more than once I resented the work. Occasionally, a wheel would stick and I had to re-adjust everything. Occasionally, I knew important things were getting smashed and neglected at the bottom of the pile and most of the time it was my stuff, my growth, and my enjoyment. But that pile of stuff in the middle was also pretty great. That cart was heavy, but pushing it gave me muscles and when I leaned on the handle, I felt secure and steady. I knew who I was and what I was doing and, best of all, I knew that what I was doing had weight and importance. Little by little, over the years, as the kids became more and more independent, the load got lighter. Hey! This is nice! I thought. I could move a little faster. I could stay a little longer at work. I started throwing a few more small items in the cart that were just for me. The boys could stay home alone while I did grocery shopping. I could actually work in a trip to the drugstore and look at make-up this time without having to hurry. Heavenly! But then, shockingly quickly, the items in the cart got sparse. Fewer and fewer responsibilities, while sometimes good, also threw me off balance. “You can drive yourself to basketball practice? Oh, that’s right, you can.” “You want to go back-to-school shopping with your friends and not me? Oh, OK.” “You leave for college when?” When I leaned against the handle of the shopping cart, I could feel it tip back on me a little bit. I missed the heaviness, the gravity, and the ballast that my role of fully-involved, fully-needed Mom had once given me. Now, I know they’ll always be my boys and that they’ll always need their mom in one way or another. And I am oh so grateful they are growing up and becoming independent young men. But now I look at this big shopping cart and sigh. It’s time to fill it up. If I let it, my job would spread out, take up the entire cart and have me huffing and puffing around the store. I’ve seen people who have done just that and it’s not pretty. No, my work will take up a good segment of the basket, but not all of it. My writing, walking, baking, photography all go in there. More time with friends, more time with HOB, more time reading-- it’s all good, so why is it that I hesitate? Why do I reserve a ridiculous amount of space in the basket for a role I no longer play? Why is it so hard to give up the Mom-as-Participant role in exchange for Mom-as-Observer role? Why does my basket seem so darn empty even with all of these wonderful things in it? Why is it that I look around, linger at the doorway, waiting to be given a task? I know this is just a transition. It’s what most moms go through at this stage. That blue light is flashing elsewhere and I’m bound to follow it, to discover new, exciting areas I’ve never been to before. I have stayed too long in one, overly-familiar department, dreading my departure from it, but I know soon it will be time to move on. When I do make my move, and it WILL be soon, my cart will be overflowing again, just the way I like it. Then I’ll be able to lean against it, balanced once more, looking forward to the adventure ahead. Sonny Boy was right. It’s just change, after all. Whoa!! My absolute most favorite BB post to date!! You grabbed my heart on this one, Betty. Please pass the tissues! And...not that you're in any hurry just yet, but the cart gets full again when the grandkids show up! Yes it's change but a change that is one of the hardest to accept. I went through it four years ago and my heart still aches for the times when they were all at home, with me, needing me. For many years, I rode that cart, standing on the back and yelling "wheee!" (well, most days, anyway) and thoroughly enjoying the ride. Sure, there were times when I had to push more than others, but the ride was worth it, wasn't it? Damn, I hate that they don't need me as much anymore. Lord knows I waited for the day that they could crawl up into their own car seat, feed themselves, use the potty, etc--but now I just want time to stop and have them ask me to help them. I'm glad that I'm not alone in the empty-cart syndrome. It helps to know that we can through a friend in there periodically, just for kicks and old times sake. :) Hop in, Betty. Wow! Such an incredible perspective from the other side. I need to call my mom more. Maybe while she's shopping. Hey congrats!! You raised two great boys. What could be better? A full shopping cart? OH, Betty ... I love this one. Major lump in the throat while reading it. 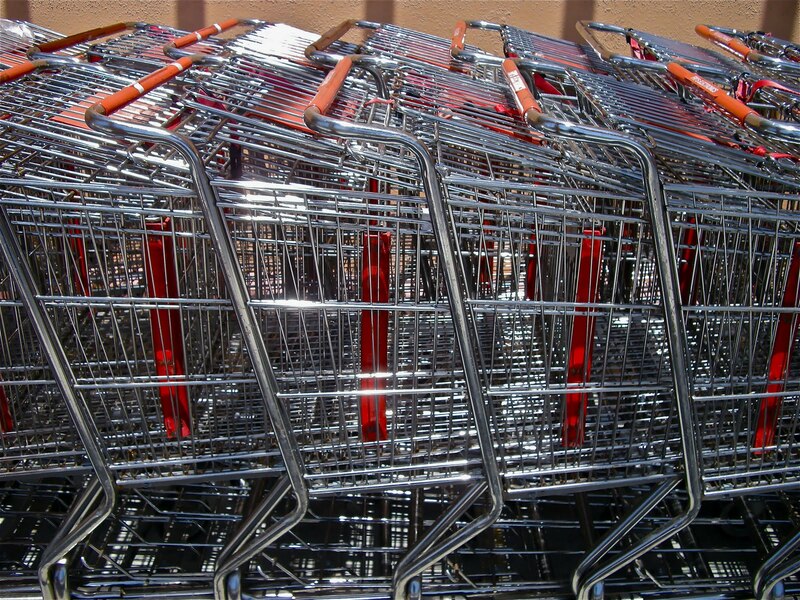 I can only pray that I will have raised 2 self-sufficient and truly good "beings" when my cart empties, as you have. You've done good, BB. And I'd be proud to sit in your cart any time! Excellent post. I see you are gradually stepping into the role of Mom to and adult son. The day my daughter started kindergarten, I remember thinking this is the first day of her life that I will not know what she is doing every single moment. Before I knew it she was graduating from college, working, buying her first condo and then at 27 she became a married woman moving 3 hours from the nest...all in the time it took me to blink. A big part of our lives is surrounded for the care we place in our children. I let it become a part of my life so slowly I didn't realize what I had until they were gone. Being an empty nester isn't always fun. Now I do things alone and it took a while to really enjoy it.My oldest still reminds me she is not a child anymore. My youngest is coming next week and I will relish each activity.I would take some cookies, my favorite flavor. WHAAAAAAAAAAAAAAAAAAAH. I don't like to think of this. Only one child...and I'm not ready for this stage! I've seen my Mom goes through stages like this and I always try to be mindful and aware when I am noticing it in her. This is the second post I've read today about the human desire to be needed, to feel useful and to know that one is making a difference. I think it's one of those human needs that often gets overlooked and tended to. Everyone wants to be useful in one way or another. Oh my goodness Betty, what a beautiful post. I'm sure there's not a dry eye among the readers. My kids are growing up so fast (8 and 11). I always have a hard time saying their ages because because to me, their my babies quickly growing into men. I know I'm just kidding myself when I say babies, because that's not the way they see themselves. Thanks so much for writing this post and sharing it with us, it reminds me that I must enjoy this time with my boys as they too will soon leave. Gosh I love this post! Written straight from the heart! You've raised such wonderful, independent boys that you can be proud of. Letting go is hard, but they'll always need their Momma! Anyone who says change is easy is a liar. You're needed in a different way now. Even though I'm grown with my own kids, there are still things that make me feel just awful until I've told my mom. She still makes things better just by being there. Wow Betty. You write so eloquently and clearly about the emotions I'm sure most moms go through when transitioning to empty nest. Somehow I think you will fill your cart when the time is just right. Thanks for stopping by my blog for WW. That was a wonderful post, I feel like I was right there with you on your journey! Hey, can we check out isle 6??? I love the moments when they show us they still need and want us like that. My daughter called me the other day and when I said hello she started to cry. She said, "Mommy I'm sick and I miss you." She's graduated from college and is a working girl, but she will always need me as her mommy. So I booked a flight to go see her for next month. I gotta. BB, you are so gifted at mixing seriousness with humor, and tying it up in a big, pretty bow! From the sounds of it, you must have been the Jillian Michaels of moms from all that heavy cart pushing you used - and still want - to do. awwww you're such a good mom! It's nice that he recognized that you needed to help and that you found the irony in the situation. I'm not a mom yet, but I can imagine it could be difficult to watch your nest deplete of it's babies! I can imagine my mom going through all of that, as I was the last to leave the house. It'll be okay, Betty. We boys never stop needing Mom. Great post, I really enjoyed it! Could you be any more adorable? You're such a great mom, Betty. What an absolutely wonderful, wonderful post! I loved it. What a wonderful way of looking at it. Yes it is just change, I've never done change very well but now I see it in a whole new light. Wonderful post Betty, being at that stage where the middle of the shopping trolley is overflowing, especially given my daughter's insistence on walking all around the grocery store and "helping" which basically means piling in all manner of things I had no intention of buying, I can still very much appreciate that empty cart feeling you now have. Your blog, writing, photography and more are all wonderful things to have to fill in the spaces with and when the time is right, something else will come along and change the contents again too. I really identify with this. And even if the cart is lighter now and is filling with "my" things, there are still times I long to go back to the way things were. Having aging parents, surprisingly, creates similar feelings of being needed and useful. Great topic; wonderful writing. Wow, I need a tissue. I can't remember the last time I read anything that so hit a respondent chord like your post, BB. There are transitions from many things. I totally understood the Not. Just. Yet. Even though I know it's gotta be, bitter-sweet for sure. Thank you, BB. I've bookmarked this post. I hope you contact your local newspaper. This post would be a great op-ed piece. Betty, You are right on the money with this one, life is like a book so to say and you are at the end of a chapter that you dearly loved, it's time to turn the page because the characters you loved in the last chapter are also in the one coming up, they have just moved on and are eagerly waiting for you to do the same, so fill that basket and turn the page my Dear Friend. I know this is easy for me to say you are thinking but been there done that Betty and from our Family to yours I am watching Cindy do the same with her basket as you are doing, it's not easy but life does move on with or without us and for our benefit we have a big basket to fill and the kids will always be there to give us reason to fill it. Great Post and I do feel for you because it is a feeling we share. Probally one of my fav posts! My daughter is a senior in college and growing into an amazing woman. My transition is slower since she lives at home. I have just had a horrid week(or2) with this household driving me insane and everything else on top of it. You`re right....shopping here with this loaded cart is well over half way for me. Oh geesh.. you expressed MY feelings so beautifully with this one. Thank you for this lovely piece of writing. Empty cart syndrome. Betty, you are amazing. You made me cry with this one - as I watch my basket getting lighter and lighter. You truly have a gift at expressing yourself with words. Excellent post! I do not even have children and it really got to me and made me think. Change is hard and sometimes we really NEED to be needed! That was beautifully written. I've never experienced that before, but I'm sure it would be difficult. Change is always hard. I am so absolutely right there with you, Betty. My older son is in his last year of undergraduate college and looking on towards getting his masters degree. My younger one is a sophomore in high school. The time is just flying by. Wonderful, well-written post. I still say all the Mom questions. I'm not giving them up so easily. I'd love to keep a permanently heavy cart, but it's the goal of parenting for it to gradually empty. Why does it hurt to do a good job? Emptying the cart is an emotional thing. And as we put stuff on that conveyor belt we find that we pay for everything in the end. Debit or credit? Perfectly written, especially your final line. One thing I don't get, though, is how he can possibly NOT need your molasses cookies? I know I do. This post was so tender, and really spoke to my heart. Having raised two sons who are adults now, I have been through the emotions you described. Now, I love those days when they call for help and I can be there to babysit, help them move, shop for them, help them plan an event, or any little thing they need. And hopefully they would jump at the chance to help me. Great post.. I read it twice..
touching and telling.. ya know. Hugging you tight, Bet! Will you feel better (slightly) if I say, I love you? You're doing a great job. I'm wondering how my Mum feels now. Sigh. I love this post, I live this post, I NEED this post to remind me how to handle this transition (definitely made easier when no-longer-child is in another country). Fill that shopping cart, and know that you have done (and continue to do) a fabulous job!! ugh... I recently posted that I fell like my oldest is growing up, breaking my heart. I know what you mean, though. That's what we want, but it does sting a bit, doesn't it? Just an excellent post. Nicely done. This is what blogging should be. Awwww Betty! You did it!!! And it was wonderful! Well that's just mean. You made me cry! As a full time working mother when my children were growing up, this really resonated with me, and I love your metaphor of the basket. A really beautiful post Betty. Left you something at my place. Tonight when I am busy making dinner I am going to make time for all 4 to help!!! This broke my heart a little. Such a beautiful post! That was a fantastic post - it's years before I have to go through that with my daughter but it's something that I am absolutely dreading! What a sweet tear-inducing post! Though be careful what you wish for . . . I'm back living at my parents' house at the age of 34. Wow, you really have a gift with words. This is such a beautiful post. I am at the beginning part of motherhood and posts like this makes me sit back and really think about where I am and to appreciate the now. After I read this I found myself being more patient with my children and just enjoying the chaos. I still look forward to the time I can do things by and for myself and leave a comment on a blog without being interrupted 6 times, but it helps to be reminded of the good I have right now. Have a great one! I like the image of a controlled life. (Bossy Betty is clearly in charge of her life) Me, I'm in the cart, which is careening wildly down the aisle with no one steering. It's a crapshoot whether I end up crashing into a mound of fragrant ripe peaches, or into a display stand of sauerkraut. This was a most difficult post to read - reading through a veil of tears is never easy. Been there, done that. Did the going-off-to-college thing - twice. Did the getting-married thing - twice. Now I'm waiting for grandchildren to fill my cart. My children, however, are being super sensible and waiting until their student loans are paid off (daughter is in her last semester for her masters) and they have healthy savings accounts. I'm proud of them, sure, but...I want my full shopping cart! PS I have a little book you need to read - Love You Forever, by Robert Munsch. Grab a box of Kleenex. It's hard to get used to being 'not needed' as a mommy anymore. But they will need you soon enough--after they move out and onto their own lives, life will send them back to you for pearls of wisdom. A lovely and precious post that brought back many memories. Good metaphor for being a mom!! Ok, I'm going to confess I'm a bit emotional today but jeez did you have to make me cry??? Loved this post...loved , loved , loved it. I feel exactly the same way . I'm not sure what to do next. And I'm afraid of turning into a crochety old woman who lacks balance in her shopping cart! I better do something about that huh? It makes her so happy that sometimes I just do it for that reason! The other night at a HS football game my hubby looks at me with tears in his eyes and says...ya' know, Mama in just 6 years this will all be gone. Our kids will be grown. and i will be okay...but man, am I gonna need some help getting through it. Thank you so much for this. You are an excellent writer!!! Oh my how hard it is. I think it's so because we are now faced with an issue of facing our mortality more than ever. Our dreams of having a family have happened and we've done all the rushing around hoping for it to turn out. We never took much time to focus on the ending because no one wants it to end. It hurt too much. Still we are the lucky ones We are the elders now and we have our kids to carry on into the future. As long as we're living a mommy we'll be we can say. My daughter called today. We had a good chat.Some of us have 'Buddy" types that need us forever. It's hard. A very touching post, Betty. You raised them to be confident and self sufficient and that's what is important. Just know, they do still need you. :( This post made me sad today ~ I totally understand what you are feeling. When you have been doing 'mom' things for so long it's hard to give it up! You've done a very nice job expressing some of what I am feeling these days. Part of me enjoys the new-found freedom but part of me knows my family will never be the same. With two already out of the house, I feel like our family has shrunk drastically. In 3 short years, the other three will be out of high school and then what? I usually see change as good, but this time it's a little unnerving. Time passes so fast, you'll have a cart full of Grandchildren and before you know it, you'll have a cart full of G-Grands. I'm visiting via Red Riter's blog. This entry choked me up. You write very well. I think that being in your presence is what your son really needed. It's an unspoken thing but as he's preparing for uncertainty and the overwhelming insecurity one feels from time to time, the comfort of being around you filled his most pressing need. Wow, did you ever hit the nail on the head! I am in similar circumstances with a senior in college and a senior in high school. Your writing is amazing and inspiring! Wow! One of my all time favorite posts. Not just by you, by anyone. What your post tells me is that you're doing a fine job in preparing your boys for adulthood. It's a darn bittersweet thing, isn't it? OH, you just made my stomach hurt a little. I am jumping off this computer now and getting sweatshirts on and we're all going for a bike ride. and this was too great. Your writing is beyond this world. I just wish you'd send this to mamapedia. It is to wonderful for more not to read. Just the young ones, to remind them it won't last forever. It's so easy to send things to post there, it's just by email. That's all. Just arrived at your blog today. Loved the writing. What a mum! What lucky boys to have you. Had a similiar conversation with my sister recently when her boy moved out ... will send her your post ... and a few tissues too! I'm in the balance - they need me but I need them to be more independent. But not TOO independent! You really do have a way of comparing things with situations that is unbelievable. I loved this post and the comparison of the situation of your kids with the grocery cart. Brilliant post! Wonderful. Congratulations on the potw. (I really have to get over here more often.) I'll have to remember this post the next time I'm ready to scream "You took your shoes off again?!?!?" "They" say it all goes so fast. Obviously, it doesn't feel that way while you're in the middle of it, but I try to remember that and appreciate my little ones all the same. and this is way way deserving. and I hear you Betty. although 2 of the 3 that are away for me , (2 still at home) , are girls , so they do "need" me a little more than my oldest , my son. they call and email and skype with shopping and skin and other questions, so there's that. Congrats Betty for again winning POTW from Hilary. This beautiful post so well deserved it. A POTW that brought tears to my cheeks, you said it all so very well. smiles. swinging back through to say congrats on the POTW! Congratulations on POTW from Hilary over at the Smitten Image. Great post! They need us for a while. We need them forever. In some way at least. Lovely sentiments. I identified. Congratulations on your Posts of the Week mention. This was a really interesting read for me, because I'm going through the exact opposite with my own twenty-year-old. I wish he'd show some significant signs of needing me a lot less than he does. Don't get me wrong, it isn't about resentment, just that he goes off and does so many adult things. I'd like to have more confidence in his ability to get things done by himself. I wonder if that's just the nature of the beast with motherhood? No matter what, no matter what we see in our kids, we worry about what it means for the future. That's one thing that doesn't change, I suppose. Mirror, Mirror, On The Floor. Betty's Lament and Potty/Punctuation Humor Too! Calling Dr. Parent. Calling Dr. Parent.